The mission of Salem VAMC Primary Care Optometry Residency is to prepare optometrists for the provision of comprehensive primary optometric care for the adult patient by providing post-graduate clinical experience and facilitating clinical acumen beyond that attained in the Doctor of Optometry program via the enhancement of diagnostic and management skills, experience in collaborative management of systemic disease in a multidisciplinary setting, and the provision of a post-graduate didactic and scholarly education program. GOAL 1: Enhance the resident’s examination skills in optometric primary care. Objective 1: The resident will develop a high degree of efficiency in the provision of primary eye care services. Outcome: The resident will provide primary eye care services involving a minimum of 1500 patient encounters, 50% of which will include ophthalmic evaluation and management sufficient for justifying Current Procedural Terminology (CPT®) codes of 92004, 92014, 99204, 99205, 99214, 99215, 99244 or 99245. Measure: A report on the number of patient encounters of this type will be generated using the VA database of patient encounters. GOAL 2: Strengthen the resident’s expertise in the diagnosis and management of refractive, physiological and pathological conditions: of the eye and adnexa. Measure: All resident charts will be reviewed on a daily basis by clinic faculty. At least semiannual audits of 5% of the residents' charts will be conducted by the Program Supervisor or other clinic faculty. The residents' skills will be assessed based on these chart reviews and by direct observation. Objective 3: The resident will determine the best management based on thediagnoses. Objective 1: The resident will gain experience in performing and interpreting ophthalmic ultrasonography. Outcome: The resident will perform ophthalmic ultrasonography (A or B-scans) and interpret the results on at least 6 patients. Objective 2: The resident will gain experience in performing ophthalmic (fundus and/or anterior segment) photography. Outcome: The resident will perform ophthalmic photography on at least 10 patients. Objective 3: The resident will gain experience in ordering and interpreting relevant laboratory and radiological procedures. Outcome: The resident will order laboratory and radiological procedures on at least 10 patients. Measure: The resident will report on the number of his/her patient encounters for which laboratory or radiological studies were ordered or interpreted using the SCO activity log. Appropriate interpretation of such studies will be evaluated by chart review. All resident charts will be reviewed on a daily basis by clinic faculty. At least semiannual audits of 5% of the residents' charts will be conducted by the Program Suupervisor or other faculty. The residents' skills will be assessed based on these chart reviews and by direct observation. Objective 4: The resident will gain experience in prescribing low vision devices for patients with visual impairment. 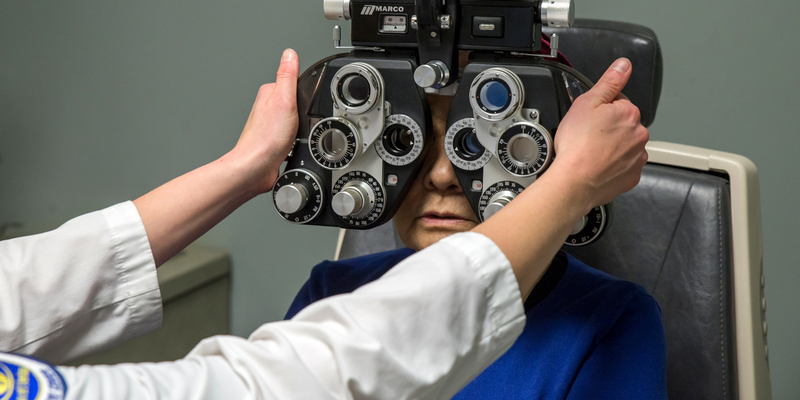 Outcome: The resident will evaluate at least 10 patients with visual impairment, determine appropriate low vision aids or other assistive devices, and educate patients regarding their use. Objective 5: The resident will gain experience in performing retinal and optic nerve diagnostic imaging. Outcome: The resident will participate complete a workshop and demonstrate proficiency in the performance and interpretation of fluorescein angiography. The resident will order and interpret other diagnostic retinal and optic nerve testing, such as Optical Coherence Tomography. Measure: A report on the number of patient encounters of this type will be generated using the VA database of patient encounters. The resident may also report on the number of encounters of this type using the SCO activity log for relevant didactic activities and for procedures that they perform outside of the Salem VA Medical Center. Outcome: The resident will gain knowledge and experience through interprofessional collaboration via rotations through at least 5 medical specialties. Measure: The resident will record medicine rotations using the SCO activity log. Outcome: The resident will present at least five lectures during didactic/scholastic meetings of the eye clinic or other health care providers. The resident will, when possible, also present posters or lectures in other settings such as meetings of the American Academy of Optometry, American Optometric Assiociation, SECO or Southern College of Optometry's Residents' Weekend. Measure: The resident will report on these types of activities using the SCO activity log. Learning Activity: The resident will provide primary eye care services involving a minimum of 1500 patient encounters, 50% of which will include ophthalmic evaluation and management sufficient for justifying Current Procedural Terminology (CPT) codes of 92004, 92014, 99204, 99205, 99214, 99215, 99244 or 99245. Objective: The resident’s expertise in the diagnosis and management of refractive, physiologic and pathologic conditions of the eye and adnexa will be enhanced. Learning Activity: The resident will provide services to a significant number of patients with refractive, physiologic and pathologic conditions of the eye, and will formulate a diagnosis based on the results of the procedures performed. Outcome: The resident will become highly proficient in the performance and interpretation of basic and advanced ocular examination techniques on patients with complex ocular anomalies and disease, and will attain advanced skills in the management of these patients. Learning Activity: The resident will perform and/or interpret ophthalmic ultrasonography, ophthalmic photography, and relevant laboratory and radiological procedures. Learning Activity: The resident will gain knowledge and experience through interprofessional collaboration via rotations through at least 5 medical specialties. Outcome: The resident will be able to communicate effectively with physicians in the comanagement of patients who have systemic disease that impacts their ocular health. Learning Activity: The resident will present at least five lectures during didactic/scholastic meetings og the eye clinic or other health care providers. The resident will, when possible, also present postersor lectures in other settings such as meetings of the American Academy of Optometry, American Optometric Association, SECO or Southern College of Optometry's Residents' Weekend. Learning Activity: The resident will prepare a publication-quality manuscript on an approved topic. The resident is eligible for thirteen days annual leave and thirteen days sick leave. The resident is also eligible for educational leave to attend approved professional meetings. Annual and educational leave is granted with prior approval of the Supervisor in conjunction with the SCO Director of Residency Programs. A. The resident is defined as an employee of the Salem VAMC and the residency stipend is paid by the VAMC. No tuition or fees are applicable. C. Professional liability protection for residents for professional activity performed at the Salem VAMC is provided under the Federal Tort claims act. Professional activity at other Southern College of Optometry affiliated clinics is covered under the College policy. D. Residents will be required to present credentials according to the Salem VAMC policy for credentialing of residents. E. Residents privileges will be determined by Salem VA policy. A. The resident is required to deliver clinical services at a level that is satisfactory to the Residency Supervisor, Director of Residency Programs, and the SCO and Salem VAMC administrations. The resident’s on-duty hours are from 7:15am until 5:00pm Monday through Thursday, 7:15am to 4:00pm on alternate Fridays, with the resident off-duty every other Friday. The resident is expected to be present in the clinic during all scheduled working hours, except when attending or delivering lectures or doing study or research. The resident may be required to be on-call for the clinic on evenings or weekends when ophthalmology staff are unavailable or at the discretion of the program supervisor. B. The resident is required to keep a record of patient contacts. The Supervisor of the Residency Program and the Director of Residency Programs will review cases periodically. E. The resident is expected to perform in a professional manner in the delivery of patient care services and to observe those proprieties of conduct and courtesies that are consistent with the rules and regulations governing Salem VAMC. H. Any resident accepted for training can be dismissed, without receiving a certificate of completion, for infractions of the rules and regulations of the Salem VAMC or those set forth by Southern College of Optometry, or for any action which jeopardizes the safety of patients, personnel, or physical facilities. A residency stipend will be provided for the year of training paid by Salem VAMC. The stipend is currently $34,888. Compensation is not contingent upon productivity of the resident. Additional benefits such as FICA and insurance are also funded. The resident will have the opportunity to purchase health insurance through the VA. The resident may also purchase life insurance through the VA.
Other employment (moonlighting) is permitted under the condition that it does not interfere with any program responsibilities including completion of written assignments. Any hours of moonlighting must in no way conflict with the hours of duty assigned to the resident. Moonlighting is not allowed during periods when the resident is assigned to be on call. The residency program at Salem VAMC is fully accredited by the ACOE, 243 N. Lindbergh Blvd., St. Louis, MO 63141, 314-991-4100.